Have you ever driven down the road and noticed folks carrying large orange garbage bags and picking up trash along the side of the highway? If so, chances are pretty good they’re volunteers with our Adopt a Highway program. Adopt a Highway is a roadside maintenance and enhancement program that’s entirely volunteer-based, and it’s something individuals, groups and non- and for-profit organizations can be proud to be a part of. How old do you have to be to participate as a volunteer? What is the minimum length of highway required to adopt and the minimum time commitment required to volunteer? What are the Adopt a Highway activities I can help with? What types of activities do groups like to do after volunteering? How do the district offices lend a hand? We arrange for maintenance contractors to collect the trash on the day of the clean up. What type of gear is provided? Answer: d, both a & b. If gardening is your hobby, you can inquire about donating plants/flowers and maintaining them in your adopted area. What type of gear can I bring? 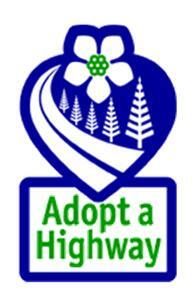 What can you apply for after participating?Answer: After helping with litter pickup, you can apply for an Adopt a Highway sign with your organization’s name. Or, if your business or organization goes above and beyond basic cleanup, ask about a customized sign to recognize your exceptional service. Feel the satisfaction of crossing volunteering off your list. If you want to find out more, you can connect with Adopt a Highway on the web or contact Your local district office.